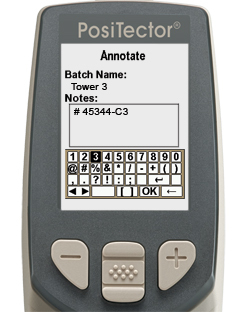 PosiTector 6000 Advanced models can record 100,000 measurements in up to 1,000 batches (groups). Users can create meaningful batch names and enter notes directly on the instrument using a familiar on-screen QWERTY keyboard. New batch names and notes can be synchronized with PosiSoft.net and are included in all PosiSoft reports.